A human production of Les Miserables comes to a crashing halt when a pack of foul-mouthed puppets overrun the theater and throw a revolution of their own! Both a brutal deconstruction and a loving tribute to the Broadway classic, Les Miz and Friends! 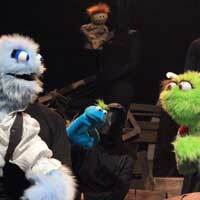 A Puppet Parody will delight Les Miz lovers and haters alike. This irreverent comedy features both parody and original music, tons of improv and audience interaction, and an angry mob of adorable furry friends. This show is not for children.